And that’s a wrap! Another successful GenBeauty event has come and gone, and so many beauty products are ready to be swatched, tested and reviewed. June 24-25 marked the second edition of Generation Beauty in Toronto and I’m supplied with products for the next few months or so. Before we get into the goods, let’s take a step back. If you’re unfamiliar with Generation Beauty, it is a 2-day beauty event that gathers brands, beauty creators and enthusiasts under one roof to meet with one another, discover products and enjoy free goodies! It’s an event created by YouTuber Michelle Phan that originated in U.S., but just last year, it went international and north of the border. I put together a quick recap post and video on the blog earlier last week, which you can check out here. Enough about the logistics of the event. What you all really want to know is what free products I received. Well, look no further! Every attendee receives a swag bag that contains a little bit of everything from all the brands. It can be picked up on either day and whenever you want. You simply need to exchange a coupon that comes with your name tag to receive your bag. Last year, we received a swag bag on each day, but to be honest, they were little change wallet-sized bags filled with maybe 5 small items. This year’s had so many fun things such as a pack of 4 Goomee hair ties, OGX cream, makeup brushes and so much more. Not only do you get those free goodies, you also have all the free products to pick up at every booth. Now, since you lug around all the free stuff with you everywhere, I suggest picking up your swag bag at the end of the day or even on the second day to alleviate yourself from dragging around a 5-pound bag (yes, makeup is heavy). I won’t go through every single product here because I’ll end up writing a novel, seriously. I’ll definitely do a video in a few days to walk you through everything. We were about 400 attendees on the floor, and everyone’s down for free swag, so it’s inevitable that there are lineups regardless of which booth you’re at. And this is where the secret access pass comes in handy. This year, they offered a limited quantity of ”Early Access” add-on tickets, which allows you to hit the convention floor an hour ahead of everyone else on both days to interact with the brands. I HIGHLY suggest taking this pass because you beat SO MUCH of the traffic, especially at the busiest booths such as MAC, NYX, Smashbox and Pixi. I spent quite a bit of time at Pixi Beauty, and since it was quieter during those first 60 precious minutes, I was able to chat with the ladies regarding their products, admire itsjudytime’s palettes, express my frustration that their entire line of products isn’t available in Canada yet, and took plenty of photos at their boho-themed photobooth. With this early access pass, we could have covered the entire floor in one day. It would have been an exhausting day, but it’s doable. At the end of both days, here’s the roundup of all the products. I love Nudestix, and they gave out a full-size makeup crayon again this year, but in richer and bolder colours. They also gave out the tin with a crayon sharpner if you let them apply your chosen colour to your lips on the spot. I was able to get my hands on two of them, and adore both of them. It was MAC’s first appearance at GenBeauty, but they made a great impression. Having probably the biggest booth and the most traffic, it was the booth to hit first, otherwise you would be waiting in line for over 2 hours. The reward? A full size lip gloss along with the matching lip liner. You get to choose between 3 colours, a red wine, bright pink or a classic red. I opted for the wine one, it’s a nice bold tint, and one that I don’t already own. 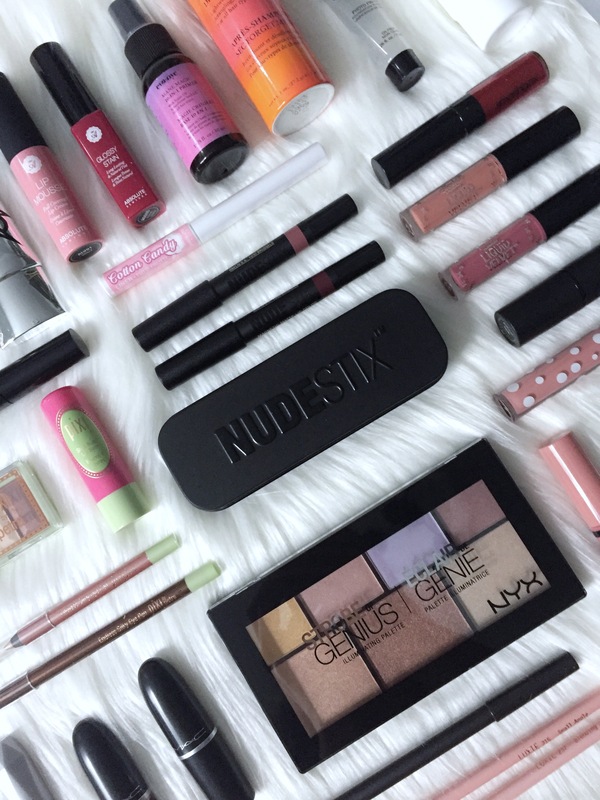 It’s NYX’s second GenBeauty appearance, and they didn’t disappoint. Last year, they gave out a lip palette, and this year, a full size face palette! All you needed to do is simply post a selfie in order to claim your palette. Many brands did this, or prompted you to follow their social media accounts to get product. I discovered Absolute New York at last year’s event, and I love their products! It was at the show where I discovered their lippies for the first time. This year, they introduced their cotton candy eyeliners and allowed you to roll up to 2 dice (if you followed one or two of their social media accounts), and whatever side the dice landed on determined the products that you walked away with. I received a lip stain and a lip mousse, both full size! As you can see from the family flatlay shot, these are only a few of the many products received. When I’m back from holiday, I’ll put together a full haul video so that you can see everything that I received, but until then, if you have any questions or comments, leave them down below!